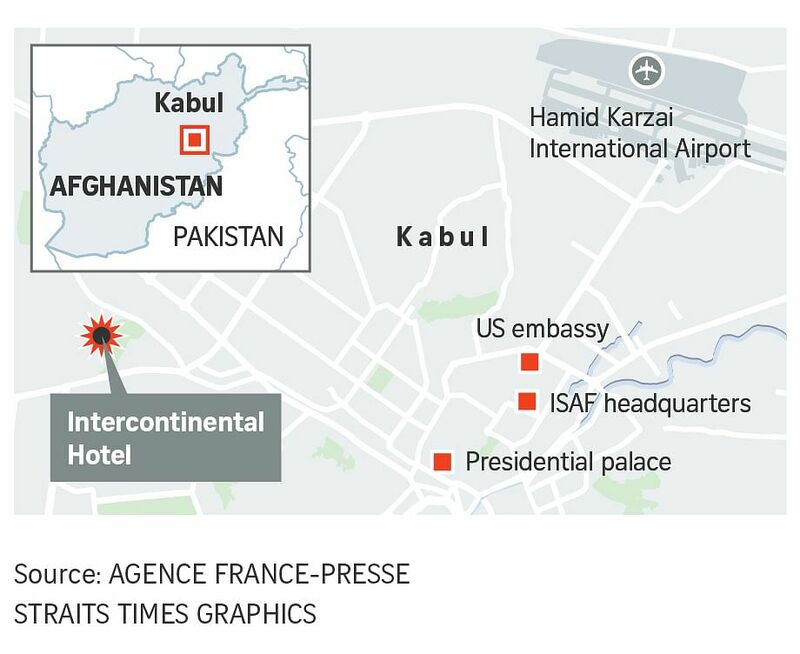 Gunmen dressed in army uniforms who stormed Kabul's Intercontinental Hotel battled Afghan Special Forces for 13 hours in an overnight siege that left at least five people dead, officials and witnesses said on Sunday. KABUL (REUTERS) - Gunmen in army uniforms who stormed Kabul's Intercontinental Hotel late on Saturday (Jan 20) and battled Afghan Special Forces through the night killed more than 30 people and wounded many more, although the final toll of dead and wounded may still be higher. However a senior Afghan security official, who spoke on condition of anonymity because he was not authorised to talk to the media, said the death toll was over 30 and might climb higher. The dead included hotel staff and guests as well as members of the security forces who fought the attackers. The raid was the latest in a series of attacks that have underlined the city's vulnerability and the ability of militants to mount high-profile operations aimed at undermining confidence in the Western-backed government. Zamari Kamgar, the airline's deputy director, said it was still trying to locate staff. The Taleban, which attacked the same hotel in 2011, claimed responsibility for the latest attack, its spokesman Zabihullah Mujahid said in a statement. A statement from the interior ministry put the blame on the Haqqani network, a group affiliated with the Taleban that is notorious for its attacks on urban targets. "They were shouting in Pashto (language), 'Don't leave any of them alive, good or bad'. 'Shoot and kill them all,' one of them shouted," Naseri said. The Intercontinental - which is not part of the global Intercontinental chain - is one of two main luxury hotels in the city. It had been due to host an information technology conference on Sunday. More than 100 IT managers and engineers were on site when the attack took place, said Ahmad Waheed, an official at the telecommunications ministry. "When the sixth floor caught fire this morning, my roommate told me, either burn or escape," said Mohammad Musa, who was hiding in his room on the top floor. Although US and Afghan officials say the Taleban has been forced onto the back foot after the United States increased its help to Afghan security forces and stepped up air strikes last year, security remains precarious across the country. The attack, just days after a UN Security Council visit to Kabul to allow senior representatives of member states to assess the situation in Afghanistan, may further weaken confidence in the government. US ambassador John Bass said the embassy was in close contact with Afghan authorities. "Such violence has no place here or anywhere in the world," he said in a statement.